Today’s guest posting moves Global Chaucers in new directions, for Megan and David’s work deals with neither The Canterbury Tales nor post-1945 translations, two parameters defining Global Chaucers thus far. Instead, they examine Sir Francis Kynaston’s 17th-century Latin translation of Troilus and Criseyde. Megan Cook is an assistant professor in English at Colby College, where she teaches medieval literature, with an emphasis on Chaucer and other late medieval poets, and researches and writes about the fate of Middle English texts and books in the early modern period. Her current book project examines the scholarly reception of Chaucer’s works in sixteenth-century England, with special interest in the role of antiquarians in the production of early printed editions. David Hadbawnik studies poetic diction in English from the medieval through early modern period. He co-edits eth press and is also co-editing a special issue of postmedieval on cross-currents in contemporary and medieval poetry. He has published an article on Spenser’s The Shepheardes Calendar, and his translation of books 1-6 of the Aeneid is forthcoming from Shearsman Books in 2015. We are delighted they accepted our invitation to bring together their collective knowledge of Kynaston and his understudied translation. Their collaboration sheds new light on what it means (and does not mean) to translate Chaucer into Latin, the global language nonpareil. While Caxton and Leland are eager to confer on Chaucer the cultural status associated with Latin literature, they are content to let his language stand unaltered (or lightly modernized). By the seventeenth century, however, changes within the English language had made Chaucer’s Middle English less accessible, and some admirers of Chaucer worried that readers would be unable to comprehend his works, much less appreciate their artistry. In 1598, Thomas Speght oversaw the production of the first edition of Chaucer’s Works to contain a glossary, and in the 1630s Jonathan Sidnam produced, in manuscript, a modernized version of the first three books of Troilus and Criseyde. Enter Sir Francis Kynaston (or Kinaston) (1587-1642) and his Latin translation of Troilus and Criseyde. It is not surprising that as Kynaston set out to Latinize Chaucer he would turn to Troilus and Criseyde, a work set in pagan antiquity and already rife with classical allusion. Although Kynaston produced manuscript copies of the poem throughout his life (distributed as gifts to friends and patrons), his translation is best known via the printed edition of the first two books, which were published in 1635 as Amorum Troili et Creseidae libri duo (STC 5097), with copious prefatory materials in both Latin and English. However bizarre it might seem to us that the effort to “preserve” and “make accessible” Chaucer’s verse led seventeenth-century writers to translate that verse into Latin, the front-matter of Kynaston’s 1635 Latin Troilus and Criseyde unfolds the logic behind the effort in a way that makes it seem natural, even inevitable. Latinized Chaucer is in some ways the logical conclusion of efforts to establish him as a properly “classical” poet; situating Chaucer in the company of Virgil, Ovid, and Homer was a project that arguably began with the former’s mentioning of those classical authors in Troilus and Criseyde (the famous “Go, litel bok” stanza – V.1786-92), and continued via the encomia of Hoccleve, Lydgate, Hawes, and numerous others through the fifteenth and sixteenth centuries. The opening epistle of William Thynne’s 1532 print edition of Chaucer – the distant ancestor of modern collections such as the Riverside Chaucer – provides a compact summary of the cultural work the poet was supposed to have done for the English language. After the “confusion of tongues” that was punishment for, presumably, the Tower of Babel, written language slowly developed, and poets came along to “adorne the rudeness and barbarity of speech.” Latin and Greek were thus “perfected,” with other Romance languages following eventually thanks to their similarity to Latin. English had a tougher go of it, but against all odds Chaucer was able to perfect the tongue not unlike Demosthenes, Homer, or Cicero. But there was a problem. English continued to change at an alarming rate. Indeed, Chaucer himself had foreseen this issue, also in that famous sequence from Troilus and Criseyde (“And for ther is so gret diversite / In Englissh and in writying of oure tonge… [V.1793-94]). How could Chaucer’s English be perfect if the language also continued to change, to the extent that readers of later ages had increasing difficulty with it? In part, the answer was a characterization of English as a fallen tongue post-Chaucer, expressing an anxiety about linguistic corruption (paradoxically via Latin, French, etc.) and lamenting the loss of an imaginary origin in the ever-receding past. Such anxiety was the backdrop to the so-called “inkhorn” controversy and disputes about poetic diction engaged in by Hawes, Puttenham, Sidney, and others through the late medieval to early modern period. There must, some thought, be a kind of English that gets us back to the Garden found by Chaucer and almost immediately lost due to the carelessness of his descendants – if only we could agree on what kind it is, which linguistic influences to exclude, which to embrace. The other answer was to leap straight to one of the classical, perfected tongues, in order to avoid the troubling issue of post-lapsarian English altogether. In this light, the logic behind the Latinized Chaucer is still curious, though ultimately sound. Indeed, the Latin Troilus and Criseyde takes its place among a broader discourse of Latin poetry (original and translation) during the sixteenth and seventeenth centuries (see, e.g., J.W. Binns, Intellectual Culture in Elizabethan and Jacobean England, 1990, and the Brill Encyclopedia of Neo-Latin, eds. Philip Ford, Jan Bloemendal, and Charles Fantazzi, 2014). In that context, translating Chaucer into a dead language is not a bizarre feat akin to the attempt at reproducing Don Quixote undertaken by Borges’ Pierre Menard, but a project of “restaurationem & redintegrationem,” of bringing “vetusta a novis, prisca ab hodiernis” – of, in other words, “restoring” a perfect poem to a perfect tongue. (Because ’twas good long since) now naught. And what we lost, the World hath found. Sees Chaucer but in Kynaston. May doubt which is the Coppy of the two. True Trojans all, they are his Countrymen. Of Bathe, in vulgar Latine scold for life. Thy death, that hast out liv’d three hundred yeare. Fram’d both a comment and Translation. In the 1635 printed edition, the Latin and Middle English text are presented alongside one another, with Chaucer’s Middle English coming from Speght’s 1602 edition. The mis-en-page advances an implicit claim that Chaucer’s English is equal to Kynaston’s neo-Latin; by demonstrating that Troilus can be successfully translated from Middle English into Latin, Kynaston offers seventeenth-century readers proof of the late medieval writer’s ability to ascend the heights of neo-classical propriety (Troilus and Criseyde’s own status as a translation from Italian hovers somewhere in the background). The two versions of the poem also gloss each other: the Latin seems likely to serve as a crib for the Middle English, but the Middle English, too, could offer some readers a point of entry into some complex Latin phrasing. In the material presented here (first two books), Kynaston’s translation is stanza-by-stanza, suggesting that his Latin provides a full equivalent to the Middle English verse. Bolstered by claims in the prefatory material for the robust representativeness of his translation, and its efficacy in restoring Chaucer from neglect and oblivion, Kynaston’s Latin threatens to eclipse Chaucer’s own verse, superseded both by the Latin translation and by the English poets that built upon his innovations. Erat, decessum ante sum conatus. My purpos is, er that I parte fro ye. As Dana Sutton notes in his introduction to the Latin text of the poem, Kynaston uses accentual meter here, rather than the more classical quantitative meter, in a pattern that most closely resembles iambic pentameter with a feminine ending. As a result, Kynaston is able to capture something of the rhythm of Chaucer’s rhyme royals verses. In this stanza, Kynaston is also able to retain some syntactic parallels with Chaucer, beginning with the “dolorem Troili duplicem,” although the stanza as a whole is somewhat less confident than the English original. While the English narrator has a clear “purpos” “to tellen,” the Latin narrator can only attempt to tell (“narare…sum conatus”). Similarly, while in the English, “thise woful vers” do, in fact, “wepen as I write,” in the Latin, they only seem to weep (“visi flere”). Amorem; Artes variae sunt & rara. In sondry londs, sondry ben viages. Immediately clear even from a visual standpoint is Kynaston’s altering of the stanza’s rhythm. While he may have arranged his syntax, as noted above, to maintain an approximation of Chaucer’s iambic line, the effect of the punctuation in line one creates a full stop to either side of “scio” (“I know”), squarely at odds with the smooth utterance of Chaucer’s narrator. Line three begins by strongly following Chaucer’s sense, with “precio” for “prise,” but what are we to make of “laudata” (“praiseworthy”) which merely seems to echo “precio,” rather than veer into Chaucer’s succinct expression that people now think old words “nice and strange”? It seems ironic that in this particular stanza Kynaston seems to have lost, or set aside, the negative connotations of these two words. “Nice” of course was often used by Chaucer to mean “foolish” or “silly,” while “strange” figures as a keyword in the poem as a whole, one that registers the movement of Criseyde through the course of the poem (see, e.g., Criseyde’s final letter to Troilus from the Greek camp, excusing herself for leaving Troy, wherein the same “strange”/“change” rhyme is employed: “this lettre he thoughte al straunge … / Hym thoughte it lik a kalendes of chaunge” [5.1632, 34]). Likewise, Kynaston cannot maintain Chaucer’s repetitive rhythm “sondry…”) in the closing couplet, and resorts to “rara” to end line seven, though Chaucer merely notes that men used “different routes” (“viages”) in different times and places. Caught in a classic translational crux, Kynaston falls victim to hunting for rhyme words that fit rather than following his text’s sense. In both lines three and seven (“laudata” and “rara”), Kynaston essentially chooses to add a related descriptor rather than maintain Chaucer’s more complex dance with meaning. A manuscript of Kynaston’s full translation, dated 1639 and now held at the Bodleian Library (MS Add. C 287), tells a slightly different story than the printed text. This version includes all five books of Troilus and Criseyde as well as the Testament of Cressid, written by Robert Henryson but published as Chaucer’s in the folio editions (Kynaston recognizes it as Henryson’s work). Unlike the printed edition, which presents the Latin and Middle English unadorned by any interpretive commentary, the manuscript includes frequent intercalations in English as well as “annotationes” in Latin at the end of each book, having to do with the particulars of the translation. Whatever Kynaston’s intentions may have been in setting out to write his commentary, this strain of analysis pops up only intermittently in the first book, and even less so in those that follow. Instead, Kynaston uses the story of Troilus and Criseyde as an occasion to recount a wide variety of gossipy anecdotes, bits of folklore, and somewhat ribald jokes. When he ventures beyond straightforward identification of characters and place names, his notes on the English text digress as often as they illuminate, and many have only a tangential relation to the material they accompany. They bring us away from a serious appraisal of Chaucer as a highbrow writer, and toward Chaucer’s later-seventeenth and eighteenth-century reputation as a “merry” writer, whose works were more likely to inspire popular pastiche and comedic reinterpretations than highbrow re-workings. At the same time, however, amidst the scurrilous jokes and entendre, there is also a serious interest in both Chaucer’s lexicon and grammar that never disappears entirely, and Kynaston remains interested in the connections between Middle English and Anglo-Saxon, as well as Scots. Kynaston’s commentary is of interest not only because it shows the ongoing evolution of what might be called a historical reading of Chaucer’s text, but because as a translator he himself is involved in a poetic assessment of the text. Thus, for example, Kynaston notes that “Tesiphone being an infernall power, & fained to be the worker of all Sorrowfull perturbations in mens minde[s] (what excellent discription may be found in the first booke of Statius Pampinius)…Chaucer hath not done amiss in going herein out of ye com[m]on path & inuoking the fury as a fitt Muse to his matter.” As with the project as a whole, the implication of comments like these seems to be the more that Chaucer can be shown to conform to the models of poetry that will be familiar to his latter-day readers (whether in terms of scansion, grammar, or decorum), the more his work will receive its due admiration. Insofar as Chaucer used the language of his own day for poetry, he could only be awkwardly imitated by those born later, and the tone and meanings of his language blurred in a single generation. Insofar as he used elevated, Latinate, and continental poetic diction, his meaning and tone remained ‘polished’ and clear, and he could be copied with relative ease. Following this “aureate” thread through the subsequent ages of poetic responses to Chaucer, critical estimations of his contributions to English, and textual editing and presentation of his works helps explain the persistent urge to “repackage” Chaucer in the linguistic image of his descendants. Thus certain poems appeared in manuscript and eventually print anthologies, according to not only religious or moralistic tastes, but also linguistic preferences. Needless to say, Chaucer’s poems were also often altered by scribes and editors for similar reasons; and poets like Lydgate rose to prominence by association, enhancing Chaucer’s legacy even as their reputations were burnished. And as noted above, it is perhaps a huge but ultimately logical step from “Latinate” to actual Latin in “preserving” Chaucer for all time. But does Kynaston’s Latin Troilus constitute a truly “global” Chaucer? 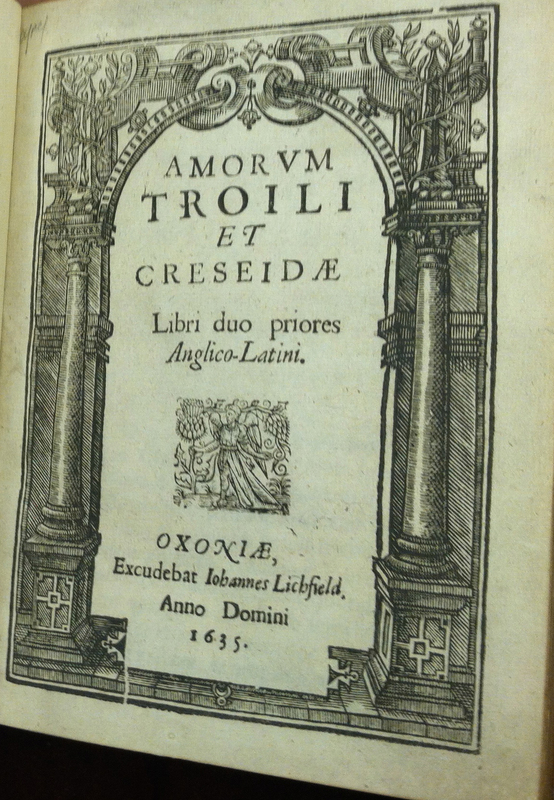 While the Latin theoretically could have made Troilus and Criseyde newly accessible to non-Anglophone readers, Kynaston never sought to publish his work abroad: the printed edition was published in Oxford (where, indeed, it might have caught the eye of some foreign academics) and the manuscript copies were all destined for readers to whom he had some personal connection. Amorum Troili et Cresidae might best be understood as a global Chaucer for a local audience. By translating the poem into Latin, Kynaston seeks to make it accessible to readers who are distanced from Chaucer’s original audience not by place or language, but by time. By leveraging the cultural prestige of Latin, Kynaston—like Caxton and Leland a century earlier—makes a pointed claim for the continued significance of Chaucer’s vernacular poem. Paradoxically, or at least surprisingly, as Kynaston moves from changeable English to a purportedly fixed Latin, he engages with many of the same concerns about translation, language change, and poetic expression that underlie Chaucer’s original. Thus, Kynaston’s translation is less concerned than it might first appear with presenting Chaucer to what would have, in the seventeenth century, been an increasingly connected and global community of Latinate readers. Instead, by demonstrating that Troilus and Criseyde can be successfully rendered into Latin, Kynaston uses Latin’s cultural standing among his fellow seventeenth-century academics to assert that Chaucer—despite his archaic language– deserves a place in the “brave new world” of early modern books and readers. Posted on November 4, 2014 November 4, 2014 by candacebarringtonPosted in UncategorizedTagged canterbury tales, Chaucer, chaucers, David Hadbawnik, Francis Kinaston, Francis Kynaston, Global Chaucers, Latin, Latin Troilus and Criseyde, Megan Cook, translation, Translations, troilus and criseyde.